During each working day, we communicate with others, whether as part of a team, with business stakeholders or clients. The conversations can range from simple to complex and difficult. We are required to manoeuvre through these communications with distractions, other agendas and priorities influencing their outcomes. As a result, there are various levels of honesty shown – to protect the status quo, team members or the organisation’s brand, to name a few. So it shouldn’t be a surprise when the statistics about lying emerge. Did you know that on any given day, we are lied to from ten to two hundred times? In her TED Talk, Pamela Meyer, author of Liespotting, talks about the manners and hotspots used by those trained to recognise deception. The following is a summary of parts of Pamela Meyer’s TED Talk combined with my comments. A lie has no power by its mere utterance. Its power emerges when someone else agrees to believe the lie. 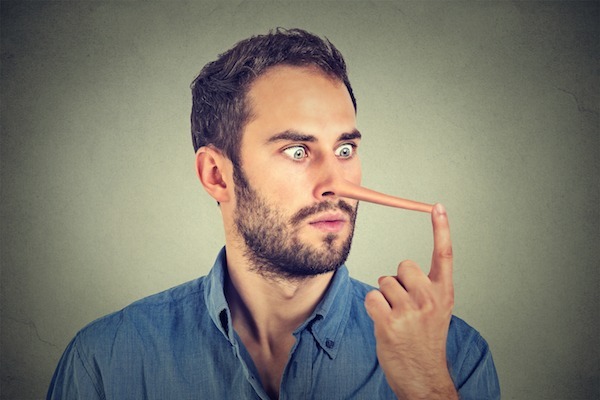 Lying has evolutionary value to us as a species. We are hardwired to become leaders of the pack. It starts at an early age. There are different levels of lying and not all lies are harmful. Sometimes we are willing participants in deception for the sake of social dignity. Then there are times when we can become unwilling participants in deception. Those lies can cause harm to individuals or groups of people and at an extreme, can compromise the security of a nation. There are a number of behaviours that liars demonstrate. An important point to note is that these behaviours are just that, behaviours. They are not proof of someone lying. When you see clusters of them, then that may be a signal. Look, listen and ask questions. With that in mind, here are seven behaviours to consider. Liars will unconsciously distance themselves from their subject, using language as their tool. So listen closely to what is said and how it is said. We often think that liars will become fidgety. In fact, they are known to freeze their upper bodies when they are lying. There is a common assumption that liars won’t look you in the eyes. Instead they look you in the eyes too much to compensate for that myth. We think warmth and smiles convey honesty and sincerity. You can consciously contract the muscles in your cheeks, however the real smile is in the eyes – the crow’s feet of the eyes cannot be consciously contracted. When you are having a conversation with someone you suspect of deception, then their attitude is one of the telling indicators. An honest person is cooperative. They are willing and helpful to get to the truth. A deceptive person, on the other hand, may be withdrawn, lower their voice and pause. Ask them to tell their story and they will include more detail than necessary in different parts of their story. They will also tell their story in strict chronological order. Liars will shift their blink rate and point their feet toward an exit. When speaking with a person, liars will take barrier objects and put them between themselves and the other person. As mentioned earlier, when you see clusters of these behaviours, they may be a signal. It is important to look, listen and be willing to ask questions. In a work situation, this could mean asking hard questions and having difficult conversations. When you combine the science of recognising deception with the art of looking and listening, then you remove yourself from collaborating in a lie. The end result is worth the effort for not only yourself but also for the harmony of your team and its ability to excel in the workplace.